From afar, my complexion appears decent. Aside from hormonal breakouts here and there, acne was never a struggle of mine, so I don’t have much scarring. However, I grew up a chronic face picker. I’ve spent hours squeezing those sporadic zits, along with blackheads in the mirror, and though I’ve cut down on the habit with age (and by never stepping foot near a magnifying mirror), I have the enlarged pores to prove it. Just ask my mom, an esthetician, who reminds me of them every time she examines my face under a magnifying lamp. In addition to my enlarged pores, I have moderate to severe lines on my forehead, so diminishing their appearance is a constant goal of mine. From microdermabrasion to at-home chemical peels, I’ve experimented with a vast array of treatments in pursuit of “perfection.” I’m not quite there yet (after all, perfection is rarely achievable!) but I’m determined to make 2019 the year I inch a little bit closer. Below, I’ve outlined my step-by-step process for trying to make that happen. I’m putting a flawless complexion and look on my list of 2019 resolutions — feel free to follow them, too! Most people gasp when I tell them I shave my face once a week. 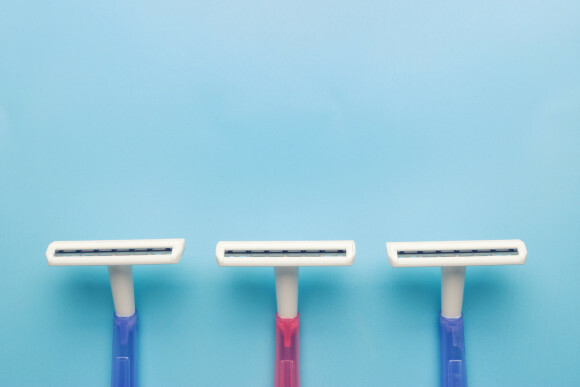 And I get it — it can be hard to envision a woman taking a razor to her chin and cheeks. But the results, I’ve learned, are worth the confused reactions, and I’m happy to explain why it’s a must in my facecare routine. The results: immediately softer face that lasts for weeks at a time. If you’d prefer to “shave” your face at home, try an at-home device, such as the DermaFlash® 2.0 Facial Exfoliating Kit ($189). The device offers less intense exfoliation than a pro treatment, but the face feels smoother and fuzz-free nevertheless. That smooth, filtered look you see on celebrities in real life is often the result of laser treatments. According to Hollywood dermatologist Dr. Harold Lancer, one that works to achieve those results is called PicoWay®, and it’s effective on all face types. “It’s a color-blind laser that is used on all ancestries and ethnicities to reduce pore size, soften scar tissue, and reduce excess pigmentation,” he explains. “It uses a near infrared frequency of light, transferring the light energy into mechanical acoustic energy to break up excess melanin clusters.” Translation: fewer age spots and an overall more even complexion. I began experimenting with injectable wrinkle reducers at the age of 24, when I became fixated on the two (now three) horizontal moderate to severe lines that span the length of my forehead. My dermatologist told me it was a good time to start, and I’m glad I did. Now, I keep up with it about every five months in order to smooth the appearance of those lines. Because microdermabrasion provides such intense exfoliation, it allows products to sink more deeply into the face. For the same reason, the treatment should be limited to a once-per-month basis, Vargas notes. A few times a week, when my face is feeling dull, I swipe on an at-home chemical peel to gently exfoliate and remove dead face. My current favorite: PeterThomasRoth® Un-Wrinkle® Peel Pads ($45), which use alpha-, beta-, and gamma-hydroxy acids to support cell turnover. Simply take out a moist pad (doused with said acids), swipe it over your face, and wait for up to three minutes before rinsing with cool water. The formula tingles while it’s on, but the afterglow is totally worth it. Before bed, I slather my face in SkinMedica® Retinol Complex .05 ($74), which I layer beneath a rich moisturizer like Weleda Skin Food® ($10) to prevent dryness. “Retinol is a synthetic derivative of vitamin A, which works to replace dead skin cells with new cells, reducing the appearance of fine lines and wrinkles, discoloration, pore size and providing an overall more radiant, smoother complexion,” explains Dr. Lancer, who recommends using it at nighttime. “The skin’s repair mechanisms are at a higher gear during hours of sleep,” he notes. A word to the wise: Your face may need to build a tolerance to retinol if you’ve never used it. Start off applying twice weekly before slowly progressing to more frequent use.